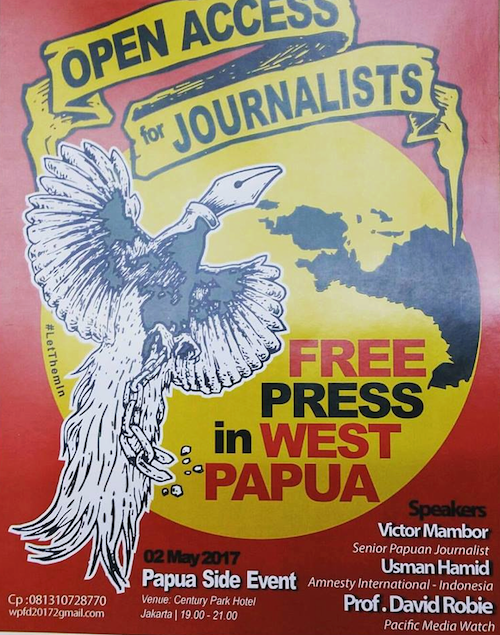 This was in spite of the brutal attack by police on Yance Wenda, a photographer for the Papuan news website Jubi, on the eve of the WPFD2017. World Press Freedom Day after covering a peaceful demonstration in Sentani. 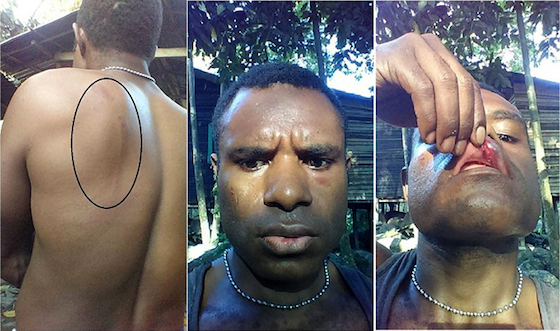 Wenda was arrested and beaten by police while covering a peaceful demonstration in support of a proposed United Nations referendum on self-determination in Sentani, a suburb of Jayapura, West Papua’s largest city and regional capital. Global media freedom organisations such as Reporters Without Borders (RSF) and the International Federation of Journalists (IFJ) immediately carried reports but this astonishingly didn’t spill over into repercussions at WPFD. As director of the Pacific Media Centre taking part in the Southeast Asian Consultative Roundtable on a Special Mechanism for the Protection of Safety of Journalists, I raised a plenary question about the “silence” over West Papua violations and got an informative answer from Atnike Sigiro of Forum Asia. But then back to the silence. I was privileged to be one of the three main speakers at the public “side forum” on a “Free Press in West Papua” seminar that night along with Victor Mambor, chief editor of Jubi and a former chair of the Papuan chapter of the Aliansi Jurnalis Independen (AJI); human rights lawyer Usman Hamid of the newly formed Amnesty International Indonesia; and moderator human rights lawyer Veronica Koman. 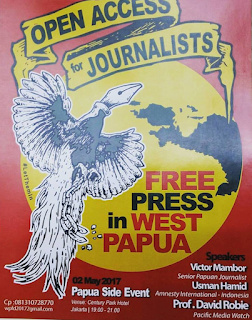 The seminar had a packed audience, including the IFJ’s media rights barrister Jim Nolan, and impressive Papuan theatre props and the bird of paradise in chains with a pen logo. 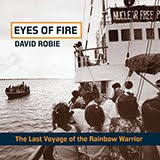 Pacific Media Centre's Dr David Robie speaking at the "Free West Papua Media" seminar. the bird of paradise with pen logo. During the evening, I spoke about President Joko “Jokowi” Widodo’s broken promises on West Papua and developments about independent media coverage and the success of solidarity networks, including the Pacific Media Watch freedom project. “Indonesia as host of WPFD wanted to convince the international community that media freedom is in fact a priority,” says Mambor. Indonesia ranks 124th out of 180 on the RSF 2017 Press Freedom Index – a slight improvement on last year. 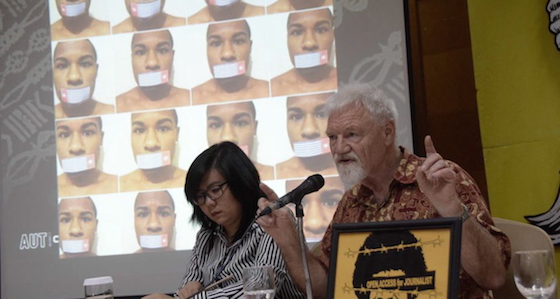 The Indonesian government has claimed that 39 foreign journalists have been given permission to report in the West Papua region since President Widodo declared in May 2015 that access restrictions for foreign journalists would be lifted. 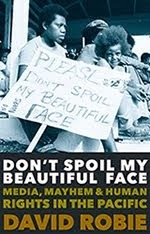 However, research by the independent journalists union AJI shows that only 15 foreign journalists – including two New Zealand radio television crews – had been allowed into the region since then. And many face serious obstacles or actual harassments and detentions. 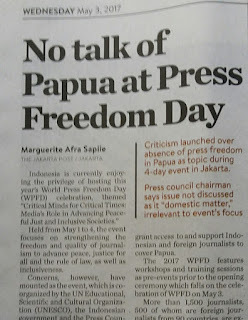 Writing in the New Internationalist, France 24 journalist Cyril Payen, whose 2015 documentary Indonésie: la guerre oubliée des Papous (Papua’s Forgotten War) was condemned by Indonesian authorities and led to the journalist’s “banning”, said the president’s promise was “too good to be true”. The French Ambassador in Jakarta was summoned to the Ministry of Foreign Affairs, says Payen. “During the tense meeting, the diplomat was told I had ‘betrayed’ their trust and that my film was ‘biased’. And as a result, I would be denied any Indonesian visa from that day onwards. Asep Komarudin, research coordinator of the Jakarta Legal Aid Institute for the Press (LBH Pers Jakarta), says a recent clampdown on websites raising issues of human rights violations is because the government claims that they include "separatist" content. "We need to ensure that any restrictions meet accepted human rights standards," he says. Komarudin adds that websites should not be restricted unless there is a "clear, transparent" process recognised by law and carried out by an independent body -"not by the government". Winner of this year’s US$25,000 UNESCO Guillermo Cano World Press Freedom Prize is Eritrean/Swedish journalist Dawit Isaak, jailed 16 years ago by Eritrean authorities without charge or trial in a crackdown against the media. His daughter, Bethlehem, gave a passionate speech accepting the award on behalf of her father. 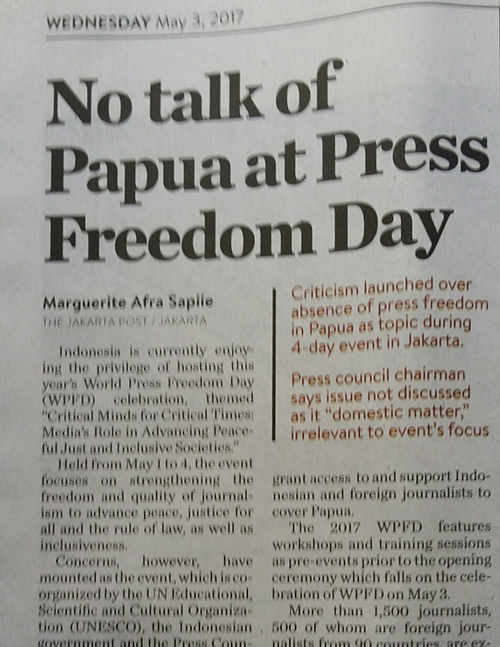 In spite of the absence of any mention of West Papua, the participants at WPFD2017 adopted the Jakarta Declaration “unanimously” during the closing session. The declaration has set down 74 articles that call for the commitment of all stakeholders to support free, independent and pluralistic media through the promotion of freedom of the press and expression in the advancement of the Sustainable Development Goals (SDGs). “We see the importance of Agenda 2030 on SDGs, particularly goal 16 on promoting peaceful and inclusive societies for sustainable development,” Zabrina Holmstrom of the Finland National Commission to UNESCO told the conference. But that also means no compromise over West Papuan freedoms and justice. 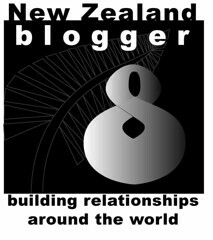 Professor David Robie is director of the Pacific Media Centre at Auckland University of Technology and was present at WPFD2017 as part of the media academic stream at the conference. This is his personal view.